GREENSBORO - Derrick Macon (6’4”, 185) and Latavious “Tay” Willis (5’8”, 165) join the Cobras 2019 roster, continuing to bulk up the receiving core. Macon, going into his second year of professional play, participated in 12 games last season for the Maine Mammoths and Lehigh Valley Steelhawks, in which he produced 199 receiving yards off 17 receptions, 173 kick-return yards off 14 returns, and 22 rush yards on 12 attempts. Macon also caught two touchdown passes during the season, both in the Mammoths’ 56-42 loss to the Cobras. “I realized I belonged [in Carolina] when we played in the snake pit,” Macon says, referring to the Cobras’ 78-9 blowout win over the Steelhawks last season. Macon completed Lehigh Valley’s lone touchdown pass in the third quarter that game to Darryl Boggan. Macon is a Miami, Florida, native, where he attended Miami Carol City High School. He later went on to play college football at Texas A&M-Commerce. A multi-threat, Willis attended and played football for Southern Illinois University, where he participated as a running back, wide receiver, and kick returner. 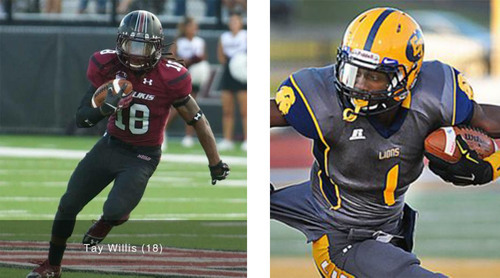 Between the three positions, Willis racked up 2,386 yards in 24 games with the Salukis. Willis is a Newnan, Georgia, native, where he attended East Coweta High School.